Want advice on kitten care? Watch our Kitten Kollege videos - purrrr-fect for new kitten owners! 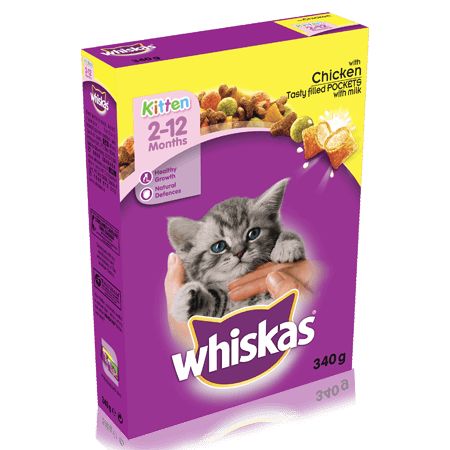 WHISKAS ® 2-12 Months Kitten Complete Dry with Chicken 340g is rated 4.8 out of 5 by 79. Rated 4 out of 5 by Sasi from Kitten loves the large biscuits My five month old kitten picks out the larger kibbles and leaves the small brown shapes until it is the only option so eats it eventually. Can you buy just the larger biscuits for kittens? Rated 5 out of 5 by SkittlesCat from Nice, kitten likes it. It's the kitten food Blinky eats, and he loves it. It seems to be perfect with a lil' wet food. 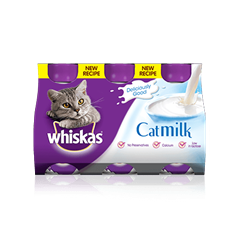 Rated 5 out of 5 by Barney29 from great My cat loved this product and there was no waste. What more do you want than value for money and a happy pet ! Rated 4 out of 5 by Monika 22 from Love them! Love them since weaned, especially small pouches inside. One star minus there is no measuring cup included, which can be very handy for new kitten owners! Rated 5 out of 5 by Bumble from Kitten loves it! I bought this for my new kitten and she devours it. Well priced too. Really pleased. Meat and Animal Derivatives (including 4% Chicken in the Brown Kibbles), Cereals, Vegetable Protein Extracts, Oils and Fats, Minerals, Derivatives of Vegetable Origin, Vegetables (4% Carrots in the Orange Kibbles, 4% Peas in the Green Kibbles), Milk and Milk Derivatives (4% Milk in the Nuggets), Antioxidants, Colourants from Natural Origin. Developed with our nutritionists and veterinarians of WALTHAM, a leading authority on pet nutrition. 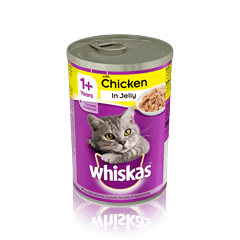 Feeding instructions: For weaning kittens soften dry food with water. Fresh water should always be available. From 12 months onwards you can feed your cat adult food. For more information on feeding your kitten, please contact our Consumer Careline. Allow for a transition phase when switching diet. Please ensure your kitten is healthy and has a healthy body shape, when using the feeding guide.